An intravenous drip is an apparatus for delivering drugs, blood and blood products, nutrients and other fluids directly into the bloodstream. A hollow needle is inserted into an appropriate vein and then attached to a length of tubing leading from a bag containing the solution. 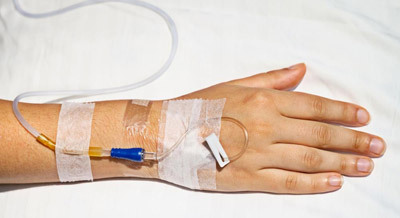 The infusion is run into the vein at a controlled rate that may be regulated by a simple clip or a computer-operated infusion pump.